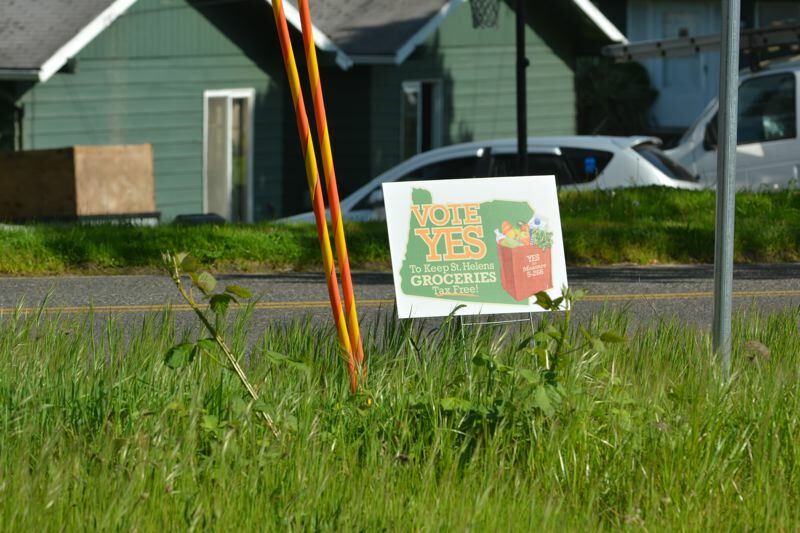 T axes on groceries in the city of St. Helens are now banned following a voter-passed a ballot initiative Tuesday, May 15. The initiative, Measure 5-266, amended the city charter and prohibits taxes on groceries for licensed grocers, farm stand operators or food banks. The initiative also retroactively prohibits the imposition or collection of taxes after Sept. 1. Unofficial totals show 89 percent of voters in favor of the initiative. Tim Mooney, a consultant to the Northwest Grocery Association, one of the biggest financial supporters of a political action committee called YES! Keep St. Helens Groceries Tax Free, said passage of the initiative indicates residents don't want food commodities to be taxed. "We know of no other issue that has received more yes votes as a percentage in Oregon history," Mooney said Wednesday. "It is an indication of just how passionate people are that groceries, as a staple for all families, should never be taxed." In October, Mooney reported that contractors organized signature-gathering in St. Helens to get the measure on the ballot, at a time when the city was discussing a possible tax on sugar-sweetened beverages. With the passing of Measure 5-266, such taxes cannot be implemented. Taxes on alcohol, tobacco and marijuana are unaffected by the measure. Josh Poling, assistant manager of St. Helens Market Fresh, was an early supporter of the measure, and said the overwhelming passage of the ban on grocery taxes is positive. "I was very happy with the results," Poling said. "It looks like close to 90 percent, and I feel like everyone felt the same thing — that they don't want their groceries taxed." Voters will see a ballot measure in November aimed at banning taxes on groceries statewide in Oregon. The ballot measure has drawn millions of dollars from organizations like the NGA, and major grocers like Kroger, Costco and Safeway Albertsons. Mooney said the results in St. Helens are encouraging in the context of the statewide action. "Well, we would not expect it to pass with the same high percentage as it did in St. Helens, but this certainly this is a great precursor to what will happen in November," Mooney said.